Redshift Search Receiver (RSR), the first-light wide-band 3 mm spectrograph currently installed on the LMT. The Redshift Search Receiver (RSR) is a novel MMIC-based receiver designed to maximize the instantaneous receiver bandwidth to cover the 90 GHz atmospheric window (73-111 GHz) in a single tuning. The receiver has four pixels arranged in a dual-beam, dual polarized configuration. Orthogonal polarizations are combined in waveguide-based orthomode transducers. Beam-switching at 1 kHz on the sky is achieved with a fast Faraday rotation polarization switch and a wire-grid to interchange the reflected and transmitted beams to each receiver. This ultra-wideband receiver typically achieves noise temperatures < 50K between 73-111 GHz. Because of the fast beam-switch involving no moving mechanical parts, the Redshift Search Receiver has exceptional baseline stability, well-suited to the detection of redshifted transitions of the CO ladder from star-forming galaxies at cosmological distances. 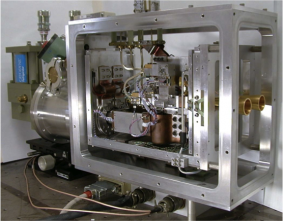 A innovative wideband analog autocorrelator system which covers the full 38 GHz with 31 MHz (100 km/s at 90 GHz) resolution serves as the backend spectrometer. The RSR was commissioned on the FCRAO 14-m telescope in 2006, and in June 2011 it conducted the first-light scientific demonstration observations of the LMT. The following link provides RSR sensitivity and integration-time calculators, which consider the latest values of surface accuracy and efficiency of the 50m primary surface. These calculators are also available in LMT-Hedwig, the LMT’s proposal submission system.